Automatic License Plate Recognition Software by Adaptive Recognition Hungary, Inc. The CARMEN Parking license plate recognition engine is a special version of the CARMEN license plate recognition technology. With integration CARMEN Parking into parking management systems, it becomes possible to automate vehicle entry to and exit from a car park or a secure zone and to use the recognised registration number for inventory management. 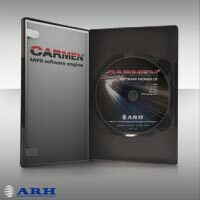 For server applications or embedded systems/smart cameras we recommend CARMEN FreeFlow to use.